To Cite: Zhou Q, Huang F, Chen L, Chen E, Bai L, et al. RPB5-Mediating Protein Suppresses Hepatitis B Virus (HBV) Transcription and Replication by Counteracting the Transcriptional Activation of Hepatitis B virus X Protein in HBV Replication Mouse Model, Jundishapur J Microbiol. 2015 ; 8(9):e21936. doi: 10.5812/jjm.21936. Background: RPB5-Mediating protein (RMP) is associated with the RNA polymerase II subunit RPB5. This protein functionally counteracts the transcriptional activation of Hepatitis B Virus X protein (HBx) by competitively binding to the RPB5; however, the effects of RMP on Hepatitis B virus (HBV) transcription and replication remain unknown. Objectives: The purpose of this study was to investigate the effect of RMP on viral transcription and replication in vivo by using the hydrodynamic-based HBV replication mouse model. Materials and Methods: Male balb/c mice were transfected with wild type (1.2 wt) or the HBx minus HBV plasmids (1.2x (-)) with or without HBx and RMP, to establish an HBV replication mouse model by hydrodynamic injection through the tail vein. The HBV RNA and HBV DNA replication intermediates (RI) were analyzed in the liver. Results: RPB5-Mediating protein could inhibit HBV transcription and replication in groups transfected with the 1.2 wt and HBx. The inhibitory effect disappeared in the 1.2x (-) groups, yet it reappeared in the groups co-transfected with 1.2x (-) and HBx. An inhibitory effect was indicated at a low dose of RMP (0.3 ug, 0.5 ug and 0.7 ug) compared to the control group and groups that had received high doses of RMP. Conclusions: Our study demonstrated that a low dose of RMP could inhibit HBV transcription and replication, which is dependent on the appearance of HBx in vivo. Hepatitis B virus X protein (HBx) is a 154-amino acid protein and has been reported as a multifunctional protein that exhibits effects on gene transcription, signaling pathways, genotoxic stress responses, protein degradation, cell-cycle control, cell proliferation and apoptosis (1-3). The role of HBx in the viral life cycle was addressed by several experimental systems. It has been shown that HBx is needed for successful establishment of Woodchuck Hepatitis virus (WHV) infection in vivo (4, 5). However, its essential role in Hepatitis B virus (HBV) life cycle is controversial. Furthermore, HBx-deficiency had little effect in HBV replication in human hepatoma Huh7 cells (6, 7), yet replication was impaired in hepG2 cells (8, 9). These may suggest that HBx has a critical role for establishment of virus infection yet not for establishment of viral replication (10). With the establishment of a plasmid-based HBV replication assay, it is now known that HBx enhances HBV transcription and replication in vitro and in vivo, although the mechanism by which HBx facilitates HBV replication remains unclear (8, 11-14). Since HBx cannot bind DNA directly, protein-protein interaction is critical for HBx transactivation. Hepatitis B virus X protein interacts with several cellular proteins, and its role in virus transcription and replication may be mediated through these interactions (3, 15). The direct interactions of HBx with general Transcription Factor IIB (TFIIB) and the RNA Polymerase II subunit 5 (RPB5) are critical for the coactivation ability of HBx, which augments HBV replication positively and modulates gene expression of cells (16, 17). The exposed domain of RPB5 is involved in interactions with transcriptional regulators including HBx (18), TFIIB (19), general transcription factor IIF (TFIIF) (20) and RPB5-Mediating Protein (RMP)/Unconventional RPB5-interacting protein (URI) (21). RPB5-Mediating protein is a RPB5 associated protein with 508 amino acids. The RMP gene is conserved among mammals and ubiquitously expressed in various tissues (21). Multiple RMP variants or homologues have been reported in humans and other species. Unconventional RPB5-interacting protein, an alternative form of RMP, was shown to participate in a nutrients-related signaling pathway that is required for gene expression (22). The RMP/URI is a component of the multiprotein PAF1 complex that is involved in histone methylation, gene expression and cell cycle regulation (23). As a major regulator of transcription and cell cycle, RMP is associated with PRB5 and other transcriptional regulators such as HBx and TFIIB. In previous studies it has been shown that RMP can not directly bind to transcriptional regulators such as HBx and TFIIB, yet the RMP binding region of RPB5 (aa 1 to 160), which is more than two-thirds of RPB5, overlaps with the TFIIB and HBx binding sites (aa 1 to 46 and 47 to 120, respectively) and RMP may interfere with the association of TFIIB, HBx and RPB5 (21). In a previous research it was shown that on the one hand the RMP can counteract transactivation through HBx ,on the other hand the overexpression of HBx could reduce the inhibitory effect of PMP on transcription (21). However, the effect of RMP on HBV transcription and replication is unknown. The current study aimed to investigate the effect of RMP on in vivo viral life cycle by using a hydrodynamic-based HBV replication mouse model. This study obtained ethics approval from the laboratory of animal ethics committee of Sichuan university. The plasmid payw1.2 (1.2 wt) contains 1.2 copies of the wild-type HBV (subtype ayw) genome and expresses HBV pre-genomic 3.5 Kb RNA under the control of the endogenous promoter of HBV (11). The plasmid payw * 7 (1.2x (-)) is a HBx-minus mutant vector, which contains an ochre termination signal (CAA to UAA) after codon 7 (at codon 8) in the HBx ORF, and has been derived from payw1.2 by site-directed mutagenesis (11). The pNKF-HBx vector expresses full-length HBx (aa 1 to 154) (16). The plasmid pSG5UTL-RMP expresses full-length RMP (aa 1to 508) (21). Male BALB/C mice at specific pathogen free (SPF), weighing 18 to 20 g, were provided by the Huaxi laboratory animal center of Sichuan university. Mice were injected via the tail vain with plasmids in phosphate-buffered saline (PBS) to a volume equivalent to 8% of total body weight of each animal during five to eight seconds (24, 25). All mice received humane care under the Institutional Review Board in accordance with the Animal Protection Art of Sichuan University. There were three groups in this study 1) 1.2 wt + HBx, 2) 1.2x (-), 3) 1.2x (-) + HBx; each group was injected with 10 μg of payw1.2 (1.2 wt) or payw × 7 (1.2x (-)) with or without 1 μg of pNKF-HBx and the same dose of pSG5UTL-RMP. The mice were sacrificed 72 hours after injection. Their liver tissue was frozen in liquid nitrogen and stored at -70˚C prior to analysis for HBV RNA and HBV DNA replication intermediates (RI). Frozen liver tissue was mechanically pulverized in liquid nitrogen and used for preparation of total cellular RNA and HBV DNA RI. Total RNA was isolated using TRIZOL (Invitrogen, USA) reagent according to the manufacturer’s instructions. Next, 30 ug of total RNA was separated on 1% formaldehyde gel and transferred to a positively charged nylon membrane (Amersham, USA). The membranes were probed with digoxigenin-labeled full-length HBV DNA to detect HBV sequence; the mouse glyceraldehydes 3-Phosphate dehydrogenase (GAPDH) cDNA was used as an internal control and membrane hybridization was detected using Digoxin (DIG) high prime DNA labeling and detection starter kit II (Roche Applied Science, USA) and X-ray film. Frozen liver tissues were mechanically pulverized in liquid nitrogen and HBV replication intermediates were isolated form 120 µg of liver tissue powder, as described previously (11). These HBV DNA replication intermediates (HBV DNA RI) were diluted in 30 µl of Tris-Ethylene diamine tetraacetic acid (TE) buffer. The HBV replication intermediates were separated on 1% agarose gels and transferred to a positively charged nylon membrane. The membranes were probed with digoxigenin-labeled full-length HBV DNA to detect HBV sequence, and membrane hybridization was detected using DIG high prime DNA labeling and detection starter kit II (Roche Applied Science, USA) and X-ray film. Northern blotting and southern blotting were exposed on Kodak BioMax MS film and quantitated by the quantity one system. To investigate the effect of RMP on the replication of HBV in vivo, we divided the mice into five groups; each group received plasmids of payw1.2 and HBx plus different doses of RMP (0, 0.3, 0.5, 0.7 and 1.0 ug, respectively). As shown in Figure 1 A and C, compared to the control group, the groups that received a low dose of RMP had lower level of 3.5 Kb RNA, which were decreased to 32.5%, 34.9% and 81.5% in the 0.3 ug, 0.5 ug and 0.7 ug RMP groups, respectively. The level of HBV RNA had no difference between the control group and the high dose group (decreased to 89.4%). The level of HBV DNA RI in these groups is shown in Figure 1 B and D; compared to the control group, the groups that received RMP had decreased levels of HBV DNA RI by 43.9%, 69.2%, 59.7% and 96.2% with a dose of 0.3 ug, 0.5 ug, 0.7 ug and 1.0 ug of RMP, respectively. Mice were injected with 10 ug of payw1.2 (1.2 wt) and 1 ug of pNKF-HBx plus different amounts of pSG5UTL-RMP (0, 0.3 ug, 0.5 ug, 0.7 ug and 1.0 ug, respectively). 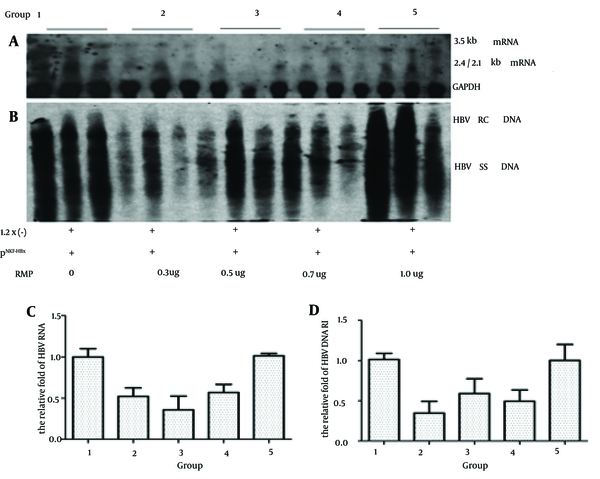 The next steps were in the following order, A, HBV RNA of mice liver was detected by northern blotting and the GAPDH RNA was used as an internal control for RNA loading per lane; B, HBV DNA RI was detected by southern blotting; C, Quantitative analysis of the 3.5 kb HBV RNA; D, Quantitative analysis of HBV DNA RI. These results suggested that a low dose of RMP could inhibit the transcription and replication of HBV; however as the dose increased the effect disappeared. To investigate whether the RMP directly influences HBV transcription and replication, we injected the HBx minus payw1.2 × 7 plasmid and plasmid vector pNKF plus different doses of RMP. 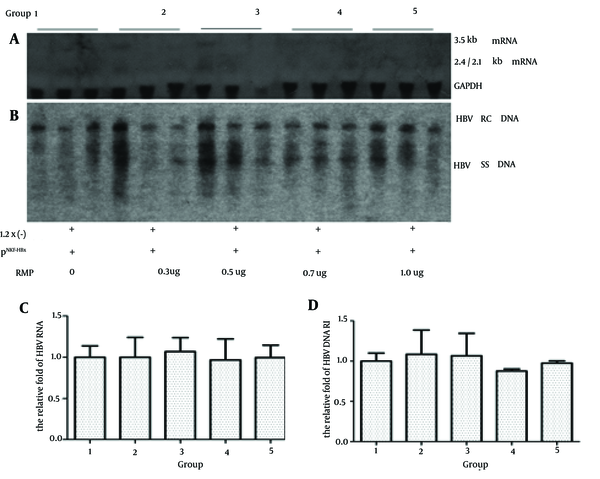 As shown in Figure 2, compared to the control group, the level of 3.5 Kb RNA was 100.0%, 106.8%, 96.7% and 99.6%, while the level of HBV DNA RI was 108.7%, 106.8%, 87.7% and 97.5% in the groups with 0.3 ug, 0.5 ug, 0.7 ug and 1.0 ug of RMP, respectively. Mice were injected with 10 ug of the HBx minus payw * 7 (1.2x (-)) plasmid and 1 ug of the plasmid vector pNKF plus different levels of pSG5UTL-RMP. The next steps were in the following order: A, HBV RNA of mice liver was detected by northern blotting; B, HBV DNA RI was detected by southern blotting; C, Quantitative analysis of the 3.5 kb HBV RNA; D, Quantitative analysis of HBV DNA RI. The levels of 3.5 Kb RNA and HBV DNA RI had no significant differences among these groups. These results suggested that in absence of HBx, RMP had no inhibitory effect on HBV transcription and replication. In addition, as indicated by Figure 1, compared to the control group the virus could still replicate in the mice liver when transfected with HBx minus plasmids, yet with a very low level of HBV transcription and replication. To investigate whether HBx played a critical role in the inhibition of RMP during HBV transcription and replication, we injected the HBx minus payw1.2 × 7 plasmids with pNKF-HBx plus different levels of RMP. As shown in Figure 3, firstly, compared to the control group, the level of 3.5 Kb RNA was 52.0%, 35.8%, 56.8% and 101.4% while the level of HBV DNA RI was 34.2%, 58.4%, 48.7% and 98.8% in the presence of 0.3 ug, 0.5 ug, 0.7 ug and 1.0 ug of RMP, respectively. Mice were injected 10 ug of the HBx minus payw * 7 (1.2x (-)) plasmids with 1 ug of pNKF-HBx plus different levels of pSG5UTL-RMP. The next steps were in the following order: A, HBV RNA of mice liver was detected by northern blotting; B, HBV DNA RI was detected by southern blotting; C, Quantitative analysis of the 3.5kb HBV RNA; D, Quantitative analysis of HBV DNA RI. In the low dose RMP groups, the level of HBV transcription and replication intermediate was partly inhibited compared to the control and high dose RMP groups. Secondly, as indicated by Figures 1 and 2, compared to control group, the HBx restored the capacity of HBx minus HBV transcription and replication in the wild type. 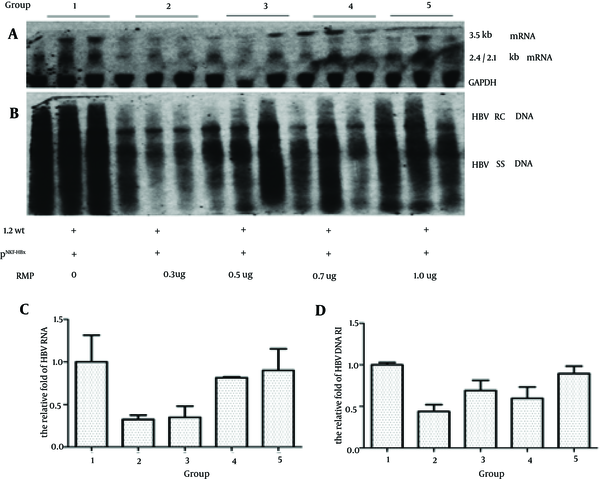 Hepatitis B virus X protein is a trans-activator that regulates a wide range of cellular and viral genes transcribed by RNA polymerase II and III. As HBx is unable to bind to double stranded DNA, it may directly modulate transcription through interaction with a variety of transactivators or factors involved in transcription (26). Previous studies have found that HBx specifically binds to RPB5, a common subunit shared by eukaryotic nuclear RNA polymerases I, II and III, and transcription factor TFIIB, and that the trimeric interactions may be involved in HBx transactivation (17). RPB5-Mediating protein is a RPB5 associated protein and specifically binds to RPB5. As RMP and the other transcriptional regulators like HBx and TFIIB cannot bind to each other, RMP regulates the transactivation of these transcriptional regulators by competing for binding to RPB5 (21). In a previous study, HepG2 cells were transiently co-transfected with RMP and HBx expression plasmids together with the pHEC × 2CAT, an HBx-responsive chloramphenical acetyltransferease (CAT) reporter. In this study RMP could counteract transactivation by HBx, and the overexpression of HBx reduced the inhibitory effect of RMP on transcription and in the absence of HBx the inhibitory effect of RMP could not work. (21). However, the level of CAT activity only reflected the transactivation of HBx yet not the level of HBV transcription and replication. In our study, RMP could inhibit HBV transcription and replication and this inhibitory effect depended on the appearance of HBx. The negative effects of RMP on HBV transcription and replication disappeared with the absence of HBx. When the groups were transfected with the HBx-minus plasmid (payw × 7) (Figure 2), RMP had no inhibitory effect on HBV transcription and replication in vivo; while inhibitory effects were seen in groups co-transfected with the HBx plasmid (Figures 1 and 3). However, there were no obvious inhibitory effects in the groups transfected with the wild-type plasmid plus different doses of RMP (data not show). The dose of HBx may have played an important role in the differences of results between the two groups transfected with the wild-type plasmid with or without HBx. The dose of HBx was nearly undetectable in the groups that were only transfected with the wild type plasmids in vitro and in vivo, being much higher in the group transfected with the exogenous HBx plasmid (8). This suggested that RMP inhibited HBV transcription and replication, which is dependent on the appearance of HBx, and the dose of HBx may have affected the inhibitory mechanisms of RMP on HBV transcription and replication. An inhibitory effect was indicated in groups that received a low dose of RMP. However, previous studies reported that RMP negative affected a wide variety of activated transcriptions in a dose-depended manner in vitro. In the HepG2 cells co-transfected with the RMP and HBx or Gal-VP16, RMP counteracted the transcription activation of HBx and Gal-VP16, in a dose-depended manner (21). However, in our replication mouse model, the inhibitory effect of RMP on HBV transcription and replication was only observed at a low dose of RMP. The capacity of HBV transcription and replication was partially restored in the high dose groups compared to the low dose groups. As the RMP and HBx cannot directly bind to each other, RMP counteracted HBx transcription activation by competitive binding to RPB5. Firstly, RMP is mainly localized in the cytoplasm, accompanied by weak and diffuse nuclear localization (27). However, HBx needs to localize the nucleus to enhance or restore the capacity of HBV replication (28, 29). The overexpression of RMP didn’t mean an increase in nuclear localization. Thus, the spatial relationship between RMP, HBx and RPB5 may affect the inhibitory effect of RMP on the capacity of HBV replication and transcription. Secondly, it is possible that RMP requires signaling processes for its function and a functional partner for its function in addition to RPB5 binding. Similar to the RMP interacting protein, DMAP1, this protein facilitates nuclear localization of RMP and augments the corepressor activity of RMP (27). Thirdly, there are several studies that have reported that RMP plays an important role in cell cycle and pathways controlling apoptosis. In humans, RMP/URI is a component of the multi-protein PAF1 complex that is involved in histone methylation, gene expression and cell cycle regulation (23). Hepatitis B virus particles released from apoptotic hepatocytes were immature and non-enveloped and proved not to be infectious. Furthermore, HBV needs to prevent apoptosis of its host hepatocyte to ensure the release of infectious progeny and, thus virus spread in the liver (30). Future studies could test the expression of RMP in the nuclear and cytoplasm of the mice liver by western blot or Immunohistochemistry (IHC) after injection, and detect the life cycle of HepG2 cells by flow cytometry (FCM) after transfection with HBV and RMP plasmids. As RMP affects a wide variety of activated transcriptions and plays an important role in cell cycle and pathways, by controlling apoptosis we could determine its’ role in hepatocellular carcinoma, in the future. Previous researches suggested that HBx has a critical role for establishment of virus infection yet not for establishment of viral replication (10). However, in our study, the hydrodynamic animal model of HBV was a replication model and the replication of virus in the mice liver only lasts for a few days (24). Therefore, in our study, we detected HBV RNA and HBV DNA RI in the mice liver after injection with the HBx minus plasmid payw × 7, and compared this group to mice injected with the wild-type or the payw × 7 plus HBx; the level of HBV RNA and HBV DNA RI was observably lower in the payw × 7 groups. These results suggested that HBx does not have an essential role in HBV replication, yet it can observably enhance the capacity of HBV transcription and replication. Despite residual replication in the absence of HBx, the effect of HBx-deficiency was reproducible and could be complemented by the addition of a second plasmid encoding HBx; this was confirmed by previous studies (8, 28, 31). In conclusion, although further investigation is required, our study found that inhibition of low dose RMP on HBV transcription and replication depended on the appearance of HBx in vivo and suggested that RMP played important roles in the regulation of HBV life cycle. This function might facilitate RMP as a candidate target molecule in the treatment of HBV. We are grateful to Seishi Murakami (department of molecular oncology, cancer research institute, Kanazawa university, Kanazawa 920-0934, Japan) for providing the plasmid of 1.2 wt, 1.2x(-) and HBx, and RMP. Authors’ Contributions: Hong Tang and Feijun Huang designed the research and provided fundamental support. Qiaoling Zhou, Lanlan Chen, Enqiang Chen and Xing Cheng performed the research. Qiaoling Zhou, Lang Bai and Min He analyzed the data. Qiaoling Zhou wrote the paper. Financial Disclosure: This project was funded by the national natural science foundation of China under grants No. 81071363, No. 30570064 and No. 2013CB911300. The funders had no role in the study design, data collection and analysis, decision to publish or preparation of the manuscript. Funding/Support: This work was partially supported by the national natural science foundation of China (No. 81071363 and No. 30570064) and the national basic research program of China (No. 2013CB911300).